POSOCO Notification is out. 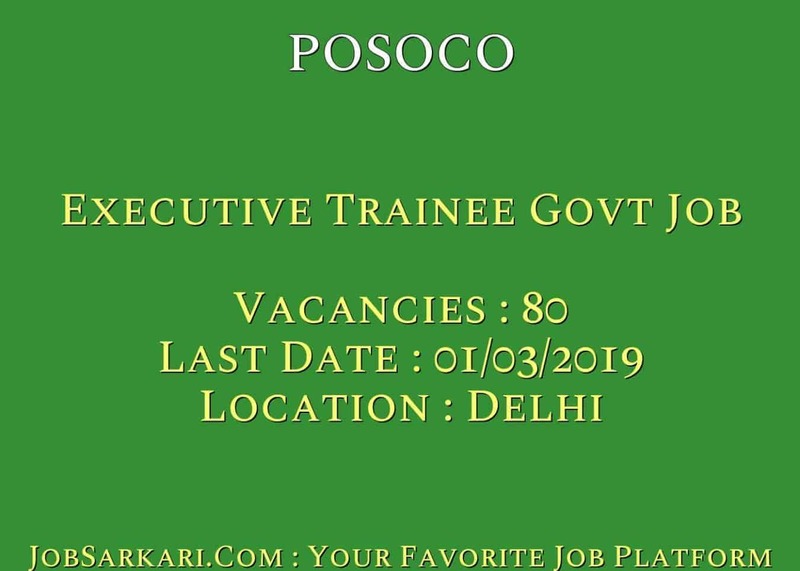 POSOCO is recruiting for 80 Executive Trainee Govt Job Posts. You can check POSOCO - Power System Operation Corporation last date, download POSOCO notification, visit POSOCO official website and check other POSOCO Vacancy details.Complete Vacancy and recruitment Details about 80 Executive Trainee Govt Job vacancies in POSOCO are provided below by JobSarkari.Com only for you. Last Date for Apply Online. 01/03/2019. ET (Electrical) Candidate Must Have Passed B.E./ B.Tech/ B.Sc (Engg.) in Electrical/ Electrical (Power)/ Electrical and Electronics/ Power Systems Engineering/ Power Engineering (Electrical) Minimum 65% or Equivalent CGPA 59. ET (Computer Science) Candidate Must Have Passed B.E./ B.Tech/ B.Sc (Engg.) in Computer Science/ Computer Engg./ Information Technology with Minimum 65% or Equivalent CGPA. 21. Total No. of Post 80. Maximum 28 Years as on 31/07/2019. 6.Online Application Can be Submitted on or Before 01st March 2019. Q. What is the Last Date For POSOCO Executive Trainee Govt Job Vacancy ? A. 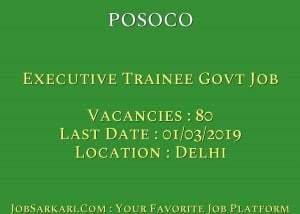 Last Date for POSOCO Executive Trainee Govt Job Posts is 01/03/2019. Q. What is the Form Type of POSOCO Executive Trainee Govt Job Recruitment ? A. The Form Type for POSOCO Executive Trainee Govt Job Posts is Online. Q. How many vacancies are available in Power System Operation Corporation Executive Trainee Govt Job Posts ? A. There are about 80 Vacancies in Power System Operation Corporation Executive Trainee Govt Job Posts. Q. What is the Full Form of POSOCO ? A. Full Form of POSOCO is Power System Operation Corporation .